ONE DAY SPENT IN WASHINGTON, DC. Women in Military Service For America Memorial at Arlington National Cemetery on Memorial Ave in Washington DC. The fact that they had already bought my bus ticket committed me to this outing, otherwise I may have not have gone. But it was worth the unexpected trip. “Thanks guys!” Actually… I’m glad that they did that. The plan for this trip was quite simple; we all for the longest have wanted to photograph something else other than New York City. We just wanted a “change of pace” from the usual photowalks. And had thought that a different city as a change of pace was a good Idea. So we all took the Greyhound bus to Washington DC. We had taken the bus at eleven-thirty that Friday night, to arrive at DC by five-thirty in the morning. Once there and at our first location, we were ready to photograph by six in the morning. The photowalk did not end until nine-thirty that night. But it was a good, long and fun adventure. I have not been to Washington DC in over ten years, so it was good to go back and explore the city once again. A word of warning to anyone that may want to visit Washington DC for the first time. If you plan on using your cell phone camera to take photos to post via Instagram. You may have little to no cell service via your carriers data plan to connect to the Internet. As well making a regular call can/could be difficult at times due to what had seem to be bad connections or dead zones with no signal. This I found this to be odd for a major metropolitan city like Washington DC. If you are wondering what was my cell carrier is. I use Sprint for my calls and AT&T portable Wi-Fi for a secure Internet connection. Part of my original plan for this photowalk was also to post photos via Instagram. But after an hour dealing with connection issues, I thought it was best to abort that part of my plan. My camera configuration for this photowalk was the following: Canon EOS 600D with a Canon EF 35–70mm standard zoom lens aperture f/3.5-5.6 as the primary lens. And a Sigma 70-300mm F4-5.6 DG Macro telephoto zoom lens as the secondary lens, incase I wanted to capture a subject from a far distance or if I wanted a tight shot. One of our first stops was Arlington National Cemetery, for a cemetery is quite a grand space with lots of history to explore. As you can see from the introduction photo in this blog post, Mind you that’s not the main entrance into the cemetery, but an actual memorial dedicated to the women of military service. We did discover a few gravesites that we had felt were quite interesting. 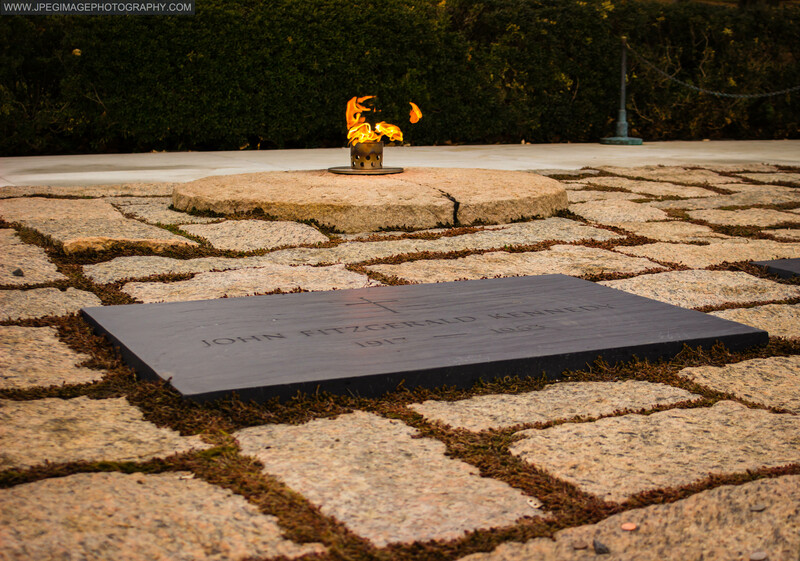 Former United States President John F. Kennedy gravesite was one of these sites. 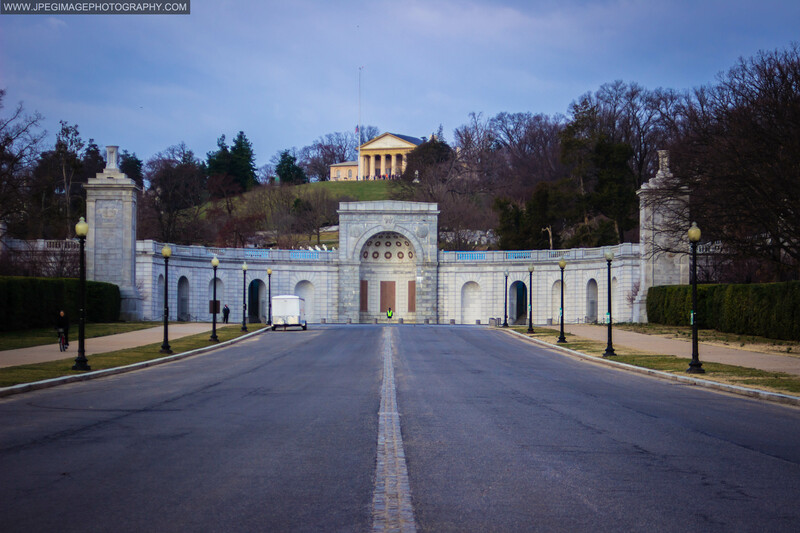 The gravesite for the former president is located on a top of a hill within a marble plaza. It’s quite a majestic view to look at, the view from the hill, the plaza and the actual grave. Another gravesite that we wanted to explore that we had thought gets overlooked by people is former Associate Justice of the United States Supreme Court Thurgood Marshalls gravesite. Gravesite of Thurgood Marshall Associate Justice of the United States Supreme Court, at Arlington National Cemetery. 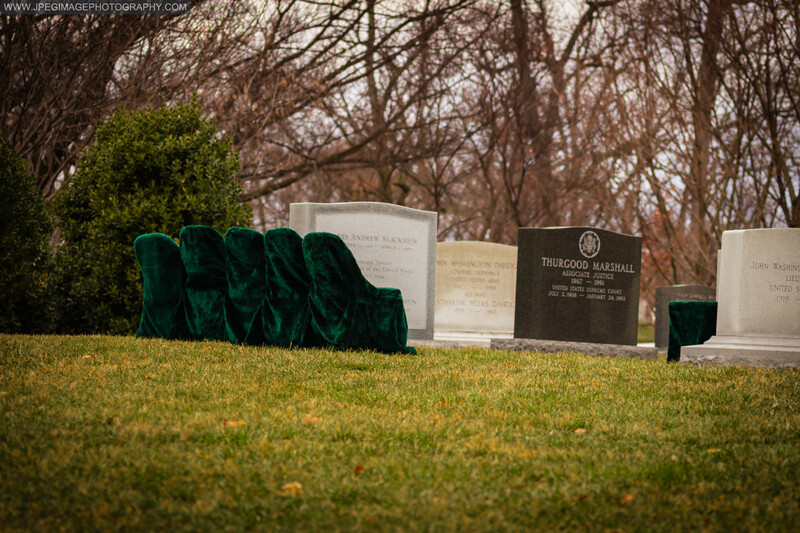 I thought that the green velvet chairs that are in view within this photograph were an interesting concept to this gravesite. Of course they are the usual graves of fallen G.I. soldiers and of loved ones as well. 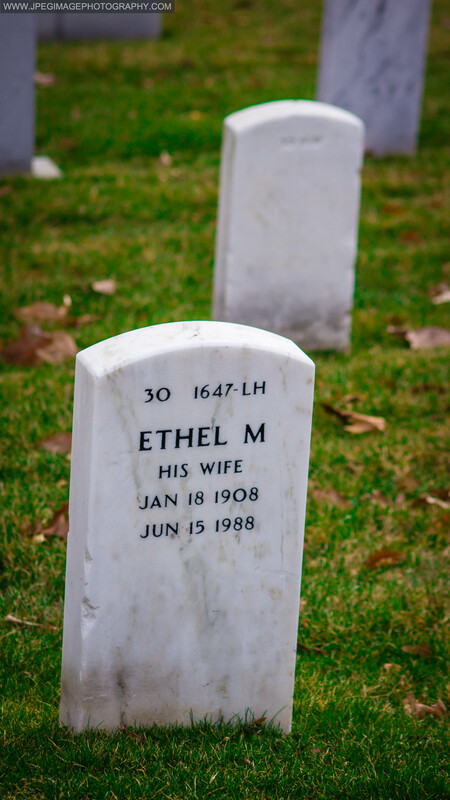 Random gravesite/tombstone at Arlington National Cemetery. 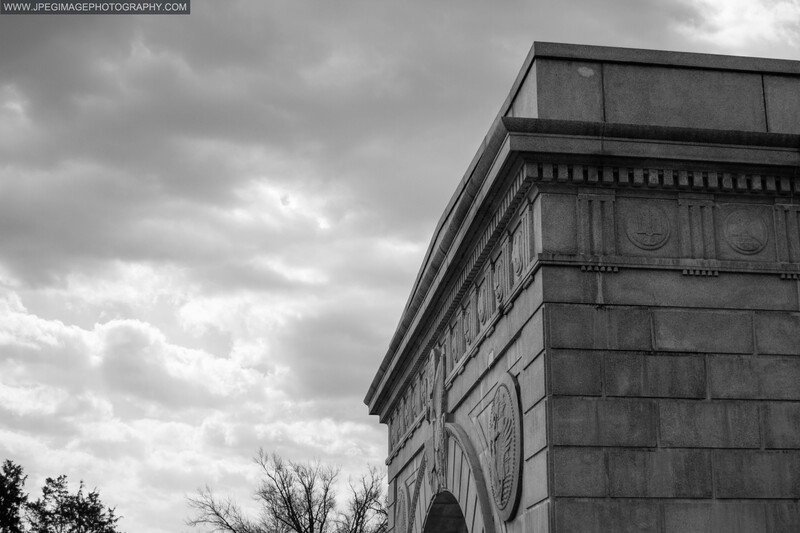 Once we had finished with the cemetery, we ventured via the Washington metro to see other monuments and points of interests. 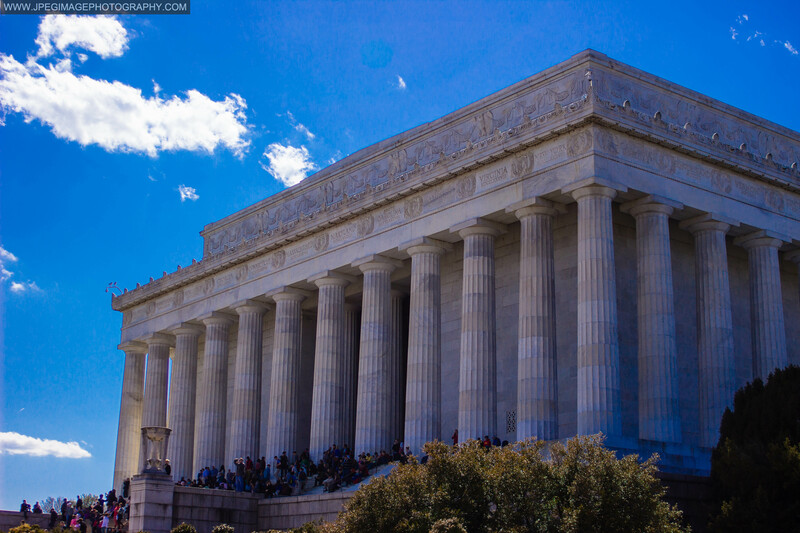 We had travel to the Lincoln Memorial and thought to take a few photos of the landmark and general area. Lincoln Memorial building in Washington DC. 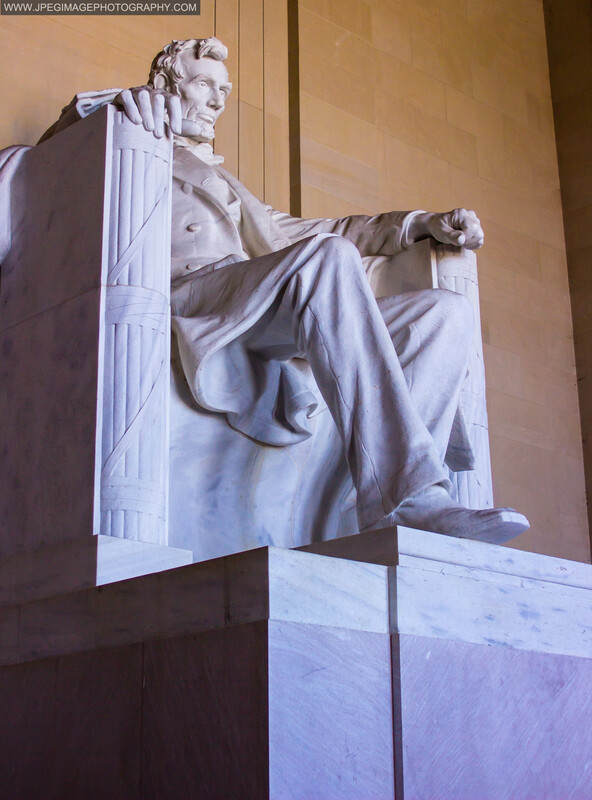 Statue of Abraham Lincoln located at the Lincoln Memorial in Washington DC. We did go to other monuments, but I did want to check out the MLK memorial for I have never seen it in person, it’s quite impressive. 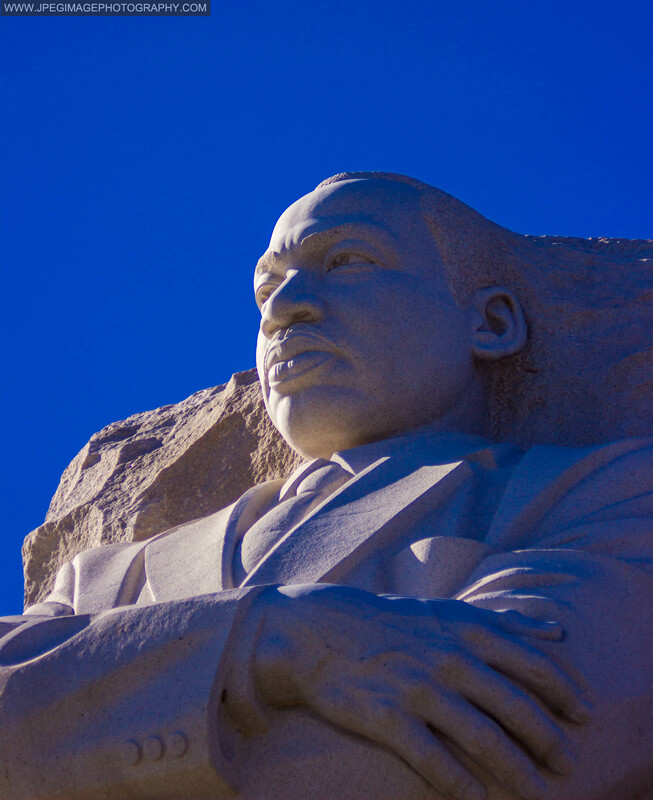 The Martin Luther King MLK memorial in Washington DC. Later on in the day the guys and I had connected with one of my social media followers who is also into photography. And since they did live in Washington he gave me and the guy’s tips on where to go around town. It was great to have someone show us around, plus adding another photographer into the group made it all the more enjoyable too. Of course at one point in time, I did my usual street and wildlife photography too. I could not resist the opportunity to do so. Young couple posing for a photograph at the Thomas Jefferson Memorial. Once the sun started to set we all knew that this photowalk would be ending for us soon, so we had to make every last photograph count. The “golden hour” as it’s usually known in photography, is the first hour after dawn and the last hour before dusk. The colors in the sky and the natural lighting are what I think to be the best anyone can have if they want to take a photo of anything during that time. But of course time becomes critical in order to find a good subject and location to photograph. For the golden hour really goes by fast so one has not much time to take a good photo if it’s not planned right. Another factor was the fact that I was visiting Washington, DC for a day. And I am not sure if I will be back again anytime soon. So once the moment is gone, it would have been gone forever in my opinion. Then while searching for the perfect golden hour photo to take. I had found it. 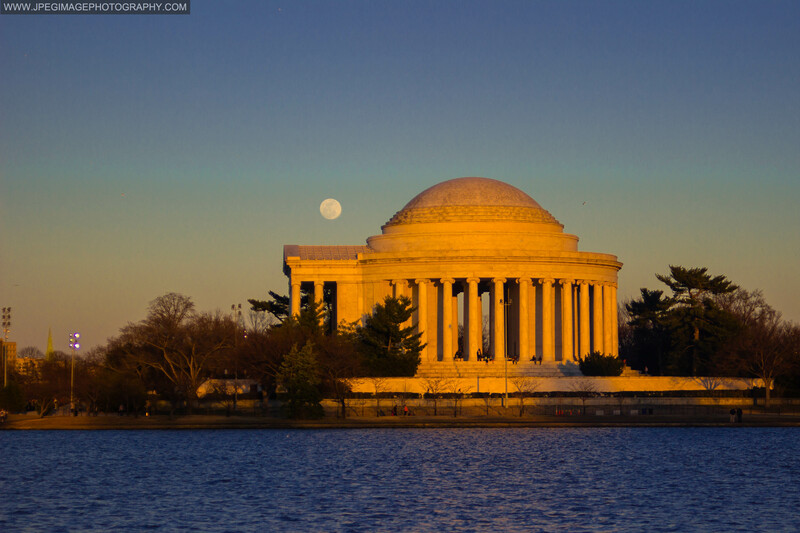 Jefferson Memorial building in Washington DC during golden hour/dusk with full moon rising. 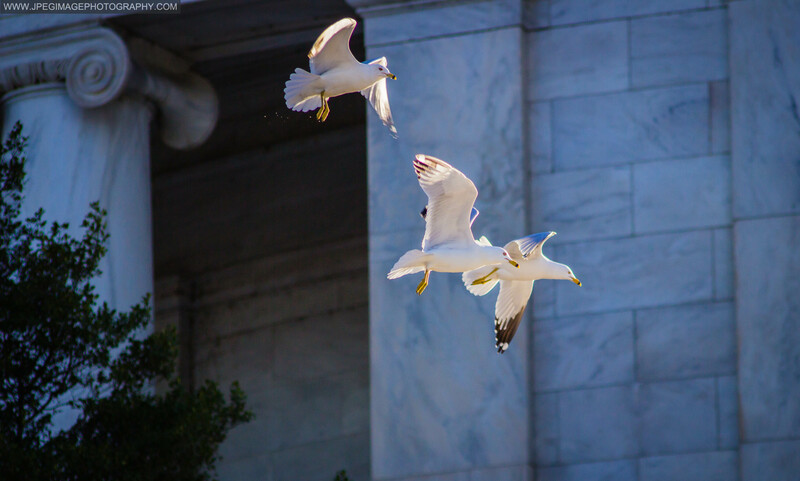 It was the Jefferson Memorial that was to be one of my final photos for the day. For I had noticed the memorial had such a great color to it from the effects of golden hour. Plus the slight mix of blue and gold in the sky and the deep blue of the water, just made for a great shot I thought. Plus the full moon that was rising above was also a good addition as well to the photograph. After about a few more hours of photographing Washington, DC, it was time to pack up all the gear and travel back home to New York City. It was a fun and enjoyable trip to do and was worth the time and effort for a day trip. 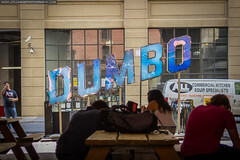 It does make me want to try another city to randomly photograph. Hopefully the guys and me will do so again. Thanks for reading, and viewing the photographs. Hope you all enjoyed this and that it inspires you to do the same and travel to any place that you wish to go to for a day.